As mentioned in a previous post, there are countless instances when I’ve witnessed A Guy, meaning a male old-house civilian who ordinarily couldn’t load a stapler, stop dead in their tracks when faced with a department store tool display. Show them a shiny new table saw, and in their minds, they’ve suddenly become a woodworker. Tools trigger some primitive, instinctual reaction in Guys, and the same is true for guns; I’ve worked for several auctioneers, and whenever we were selling a firearm, every Guy would pick it up, chamber an imaginary round and aim at the chandelier. As someone who spent two summers teaching eight-to-ten-year-olds how to handle live ammunition, I automatically ducked and rolled whenever I saw a Guy draw a bead on a lighting fixture. I’ve got a basement full of tools, but I’m hardly some wannabe; I’ve used every one of them, either professionally or on my own wreck of a place. I’ve acquired them as needed and appreciate them, but have never coveted tools; to me they’re about getting a job done as opposed to fulfilling a fantasy. Admittedly, I take almost no care of them, and their blades are often dull and several of their power cords are cut and spliced due to miscalculations on my part. They reside in milk crates and are covered with moldy sawdust film until their presence is required. I tend to buy contractor quality as opposed to the industrial or cabinetmaker caliber, and shop for value; thus, my drill was expensive, because I abuse it and I got tired of burning out $40 homeowner models. My coil-nailer, on the other hand, is a low-end refurb, as I don’t do a lot of roofing anymore, but had a big project. If it ever blows out, I’ve already gotten my money’s worth. Speaking of which, that coil-nailer may have inspired visions of slapping down them triple-tab roof shingles and thus protecting hearth and home from the elements when you were window-shopping on Amazon, but you’ll realize, as you trudge up the ladder with a bundle cutting into your shoulder and the summer heat is blasting off the roof, that a nail-gun conjures up about as much fantasy as a vacuum cleaner. It’s hot, you’re tired and you’ve got five more squares to lay before you break for dinner. Back to the aforementioned table saw. It’s possibly the most versatile tool (at least in promise); and one cannot help but imagine themselves cranking out kitchen cabinets, bathroom vanities and even dressers for nieces and nephews, just for the hell of it. In actuality, the table saw is the most potentially lethal weapon in your arsenal, and demands experience and respect. Tales of injuries abound, and the unspoken truth is this: the day you lose your apprehension of your table saw, it will involve a trip to the emergency room, and you’ll spend the rest of your life watching conversational partners glance down at your disfigured hand and then quickly look away. And then there’s the Sawzall: one dreams of demolishing those unwanted walls or delicately nipping off the finish nails between plaster and molding, but bear in mind that the Sawzall is an equal opportunity means of devastation. It treats studs, nails, gas-lines and Romex with indifference, and like the table saw, it insists upon your attention and respect. I rely on my Sawzall; I can’t imagine working on a house without it, yet I never regard fondly as if it were a guitar or a sports car. I guess my one indulgence is the lathe. I’ve used one since middle school, and when I was an antique restorer, it was indispensible in recreating the invariably missing spindle or table leg. When I moved shop and stopped fixing everyone else’s furniture a few years ago, I no longer had access to one, and felt its presence missing. I bought a cheap Chinese lathe on ebay, but truthfully, have turned only one chair stretcher since. Lathes are pretty specific to furniture and perhaps the 1880s ball and spindle decorations on some houses. It’s leaning against my jointer, which is also not as necessary, for I buy FAS lumber now, having grown too lazy to mill my own rough-sawn. Strangely enough, my most personal, yet least expensive, tool is my hammer; it’s a 16-ounce, leather handled rip model. 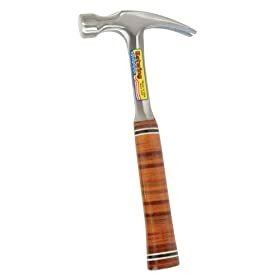 It’s available everywhere, and of all the hammers I’ve ever used, this one feels like a natural extension of my arm. This post is just a musing about tools, for we who build or restore must contend with them daily. We don’t dream about tools, or what we will accomplish with them; we’ve moved beyond that, because they are part of the household. There’s no guidance being offered about what you should or shouldn’t do the next time you’re in a hardware store, that’s up to you. Maybe I’m just trying to save you money. Or some fingers.